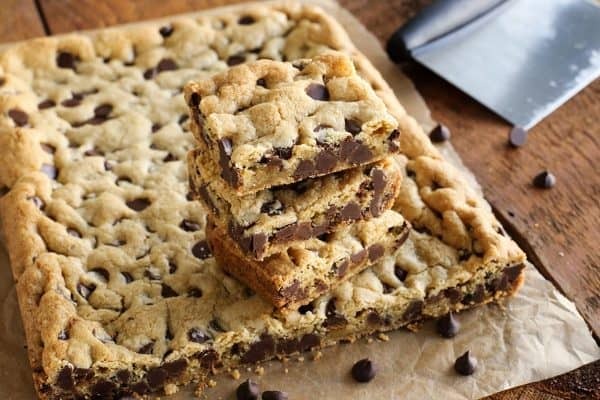 Chewy Chocolate Chip Cookie Bars are baked in a pan, a quick and super easy chocolate chip cookie recipe with no mixer and no chilling. You’ll love how soft and buttery these are! Well, Hello Spring. We’ve been waaaaaaaaiting for you! This date, March 20th, holds so much more significance for our family than saying “Goodbye, Winter”, however. It’s also my dad’s birthday. And Hatti’s birthday. Yes, our oldest daughter was born on the same day as my dad…and just two days after Blake’s dad’s birthday. 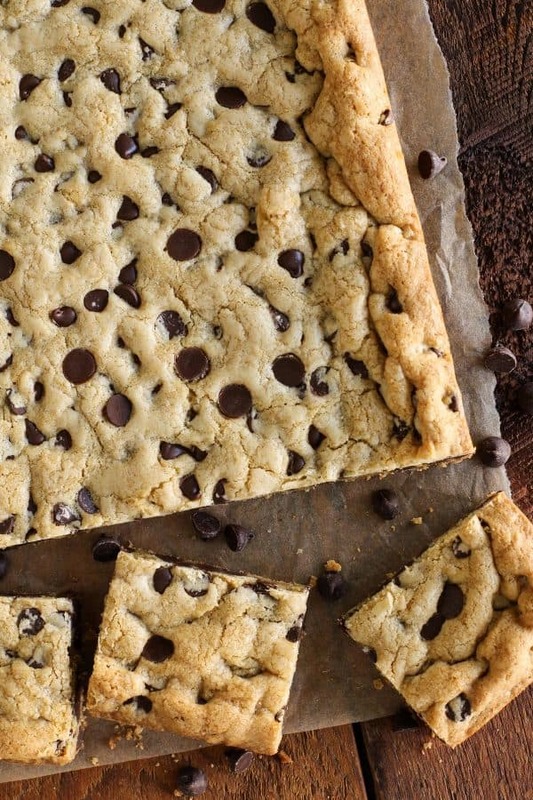 This year, it’s all about enjoying those chocolate chip cookie flavors, with easy-to-make bars. You’re going to appreciate the fact that you can whip up a pan of these Chewy Chocolate Chip Cookie Bars in less than 15 minutes. 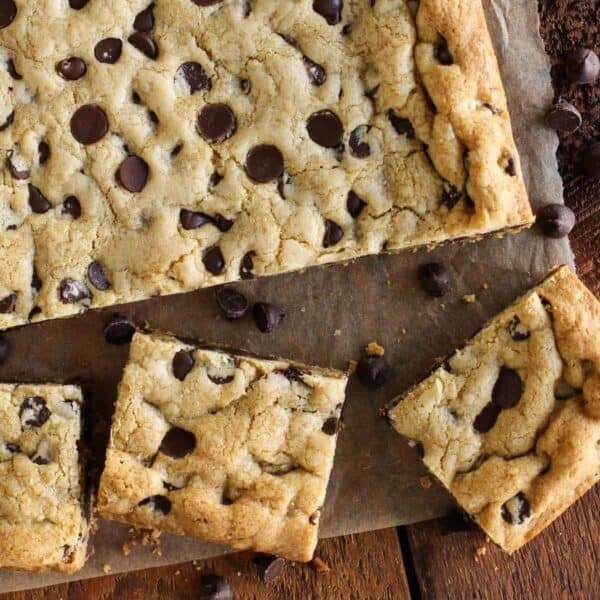 But even more than that, you’re going to love how buttery, chewy, and absolutely fantastic these cookie bars are. I promise! 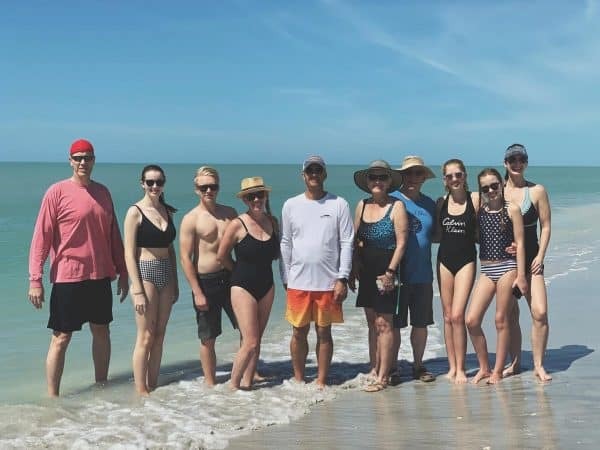 We just spent the past week of Spring Break on the gulf coast of Florida, staying with my sister’s family. My parents were also there. My sister and her husband are boat club members, and got us out on the water several times. The sun’s warmth was healing, the very best cure for our long Minnesota winter. And having our daughter and her grandpa together just a week before their birthday, well you know that called for some early celebrating! 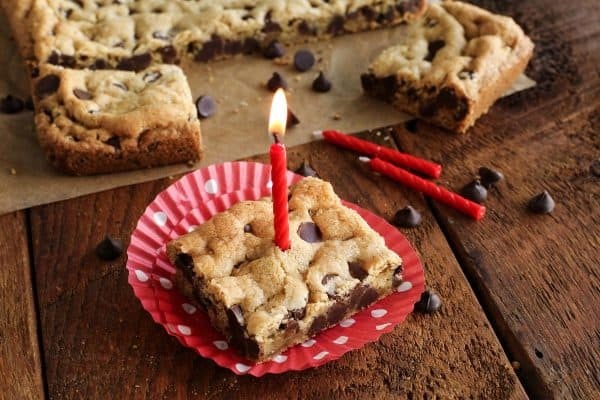 I realize that these chocolate chip bars may not look the most celebratory when it comes to a birthday treat. 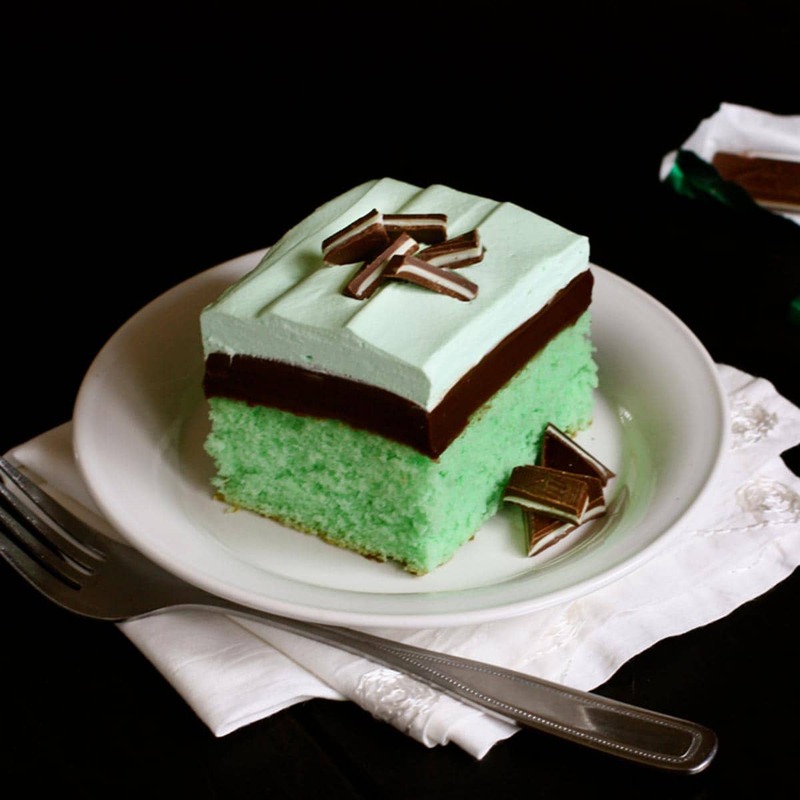 It’s not exactly a 3-layer cake piled high with buttercream, adorned in sprinkles. But I can’t imagine anyone turning down one of these chewy treats, any day of the year. 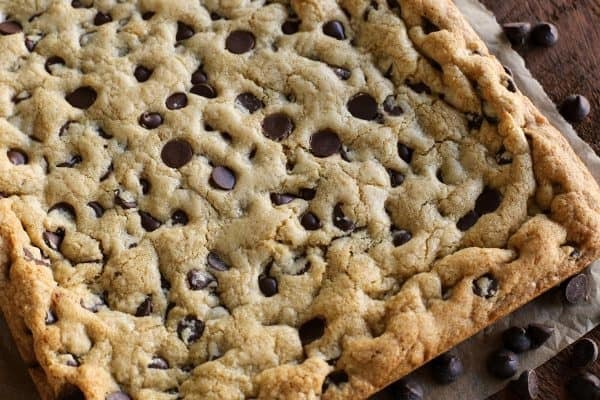 They are a chocolate chip cookie party in a pan! I also know how Hatti likes to bake a pan of her favorite brownies to treat her friends. The brownies are quick and easy to make, an old family recipe, and always disappear FAST. So my sharing this new cookie bar recipe does serve another purpose. It’s another easy and especially wonderful recipe that I’m sure Hatti will find herself making for her friends, for many years to come. 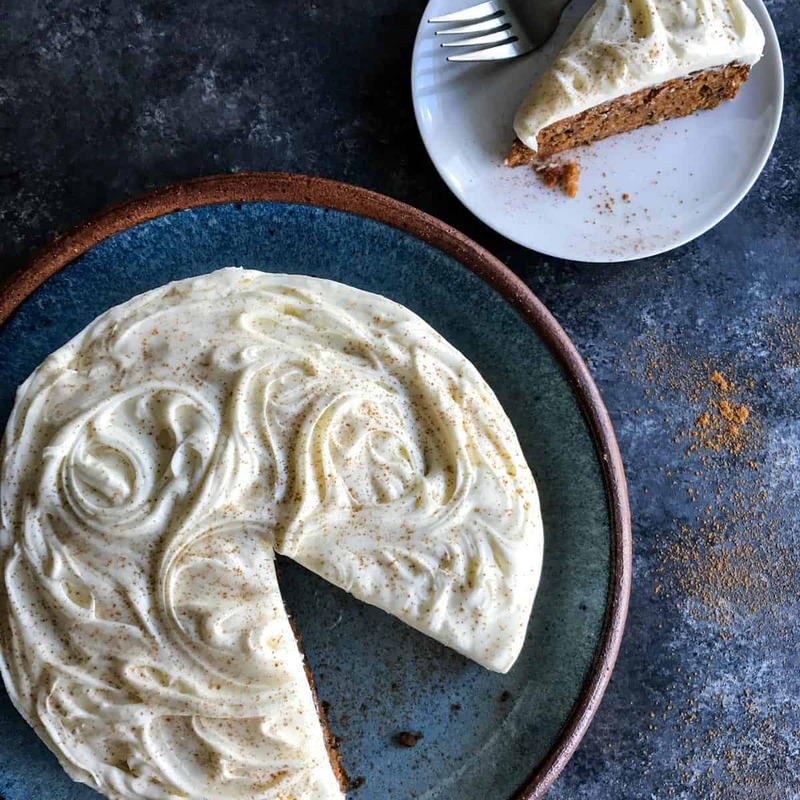 This recipe is a great way to quickly cure any CCC craving. To achieve clean cuts to bars, brownies, and cakes, I’m a big fan of lining the pan with foil or parchment paper. 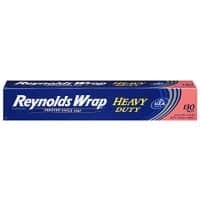 I prefer to use heavy duty foil for this recipe, and to let the foil overhang on the long sides of the pan. Then, after cutting around the perimeter of the pan, simply grab the foil overhangs and lift the bars out of the pan. Place the bars on a cutting board and cut into individual pieces. 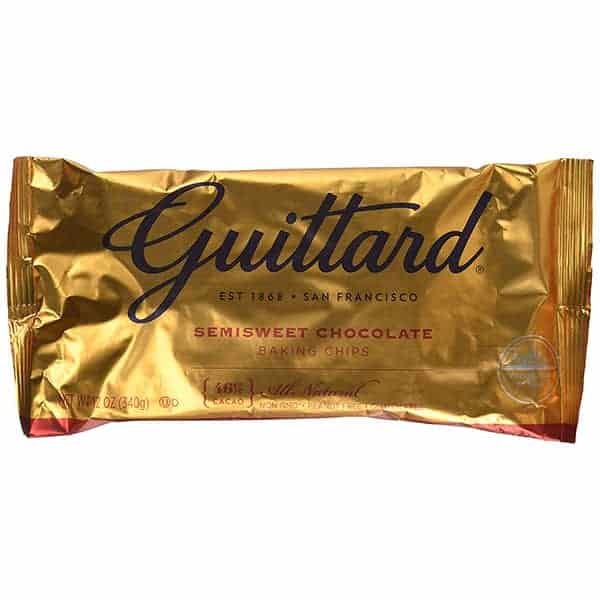 If you have a rigid pastry cutter, it does double duty as a great bar-cutting tool. Happy Birthday, Hatti and Dad! We love you! 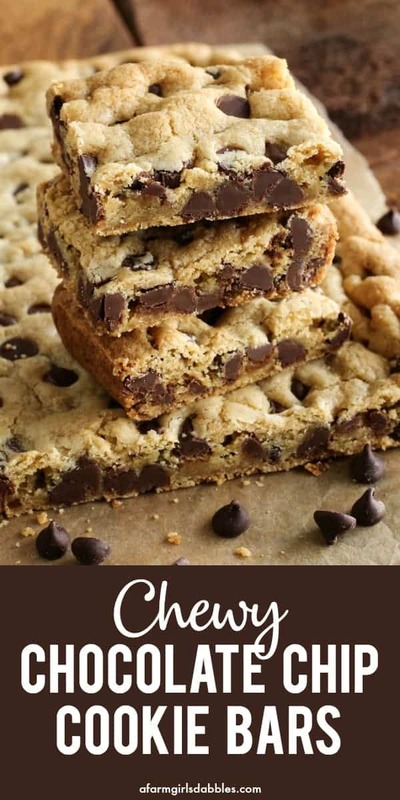 Like this chocolate chip bars recipe? Pin it! 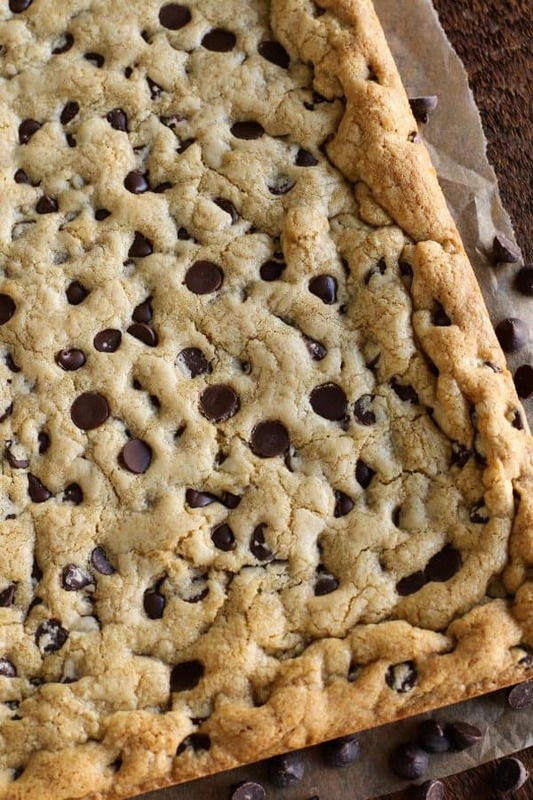 In need of a quick chocolate chip cookie fix? 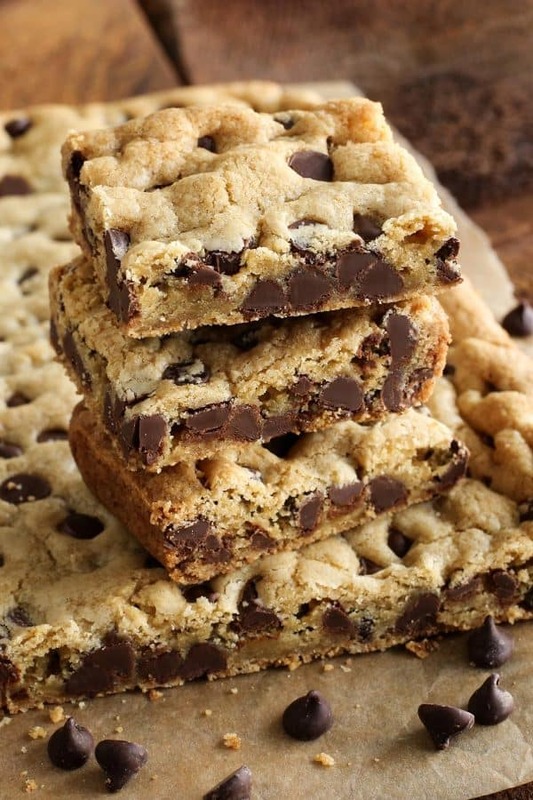 These chocolate chip cookie bars are super easy to make, with no mixer and no chilling. You'll love how soft and buttery and chewy these are! Adjust oven rack to lower-middle position. Preheat oven to 325° F. Line a 9" x 13" baking pan with heavy duty foil, letting the excess hang over the edges of the pan on the long sides of the pan. Lightly spray the foil-lined pan with non-stick spray. In a medium bowl, whisk together flour, salt, and baking soda; set aside. 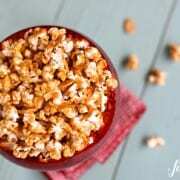 In a large bowl, whisk together melted butter, brown sugar, and sugar until combined. Add egg, egg yolk, and vanilla, and whisk until well combined. With a rubber spatula, fold dry ingredients into the wet mixture. 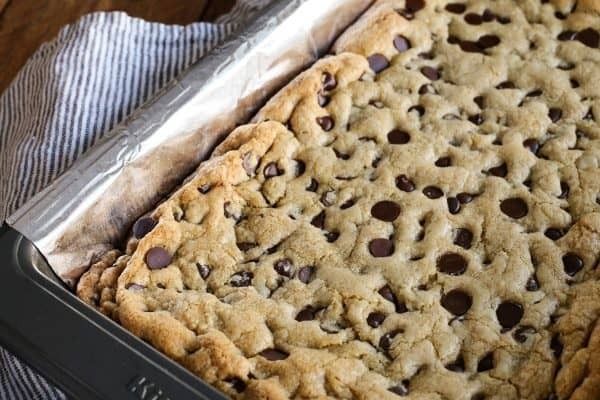 When about half-way combined, add chocolate chips and continue to fold until just combined. Do not overmix. Transfer mixture to prepared pan. This will be very thick. Press evenly into pan using the spatula and/or your fingertips. (Tip: Dough mixture can be sticky. I rub my finger tips in a little butter, and then press the dough into the pan.) 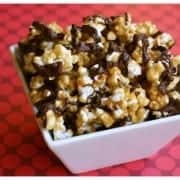 If desired, sprinkle a few more chocolate chips over the top, pressing them in a bit. Bake for about 24 minutes or so, or until top is light golden brown and slightly firm to the touch. The edges will start to pull away from the pan, more golden in color. For the chewiest bars, do not over bake. I might even recommend to slightly under bake! Remove pan to wire rack to cool to room temperature. Cut around perimeter of pan to loosen, and then lift bars from pan using the foil overhangs. 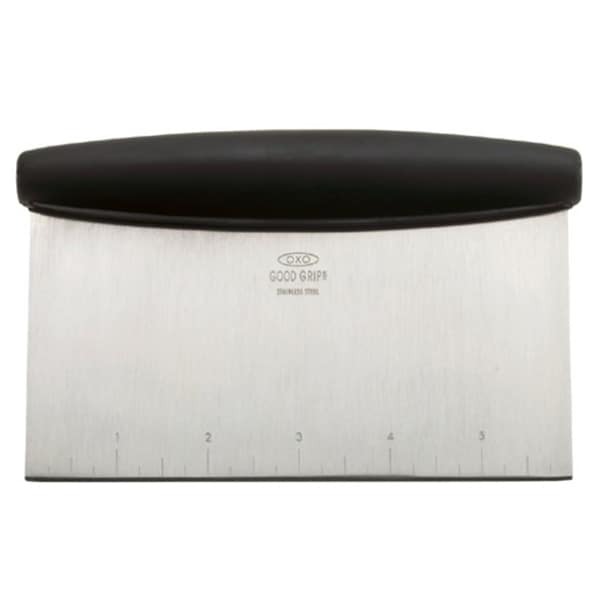 Transfer to cutting board and cut into squares with a knife or rigid pastry cutter. usually leave comments because I always change a bit the recipes but not this one. It was awesome, no need to take or add anything. Thank you for sharing! Made these yesterday. I thought about adding some walnuts or toffee bits but it’s perfect just like it is. Nice not to mess with drop cookies. As usual, another great recipe from you, Brenda. Did you have Holsteins on your farm growing up? Hello Carolyn – thank you for coming back to leave a comment. 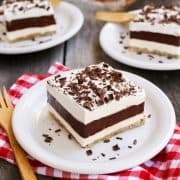 I’m so happy you liked this recipe, and that you’ve liked others as well! Cows…my dad had some cows when I was very young, so I don’t have much of a memory of the animals (also pigs and chickens). He sold all the livestock when I was little, concentrated on grain farming. Thanks so much for the recipe :) I’m always looking at ccc recipes and this one was a keeper! My only changes were based on preference – only 1 cup of cc, 1 TB vanilla, 3/4 tsp sea salt, and only 2 c of flour. The kids loved the fact that these were bars – and I truly appreciate the ease of baking bars over drop cookies. Thanks again! Looks good!! Already printed the recipe.